It’s amazing to think of the musical history of the Surf Ballroom has had on music. Music really does live on at the Surf Ballroom. Take a tour of the Surf Ballroom and find out that these walls do talk with musical memories! The seven photos that exist from the night of the Winter Dance Party. Feb 2, 1959 marks “The Day That Music Died” as sung by Don McClean though music is very much alive at the Surf Ballroom! It is simply amazing to walk the halls and look at all the photos of musical legends who have played at the Surf Ballroom over the years. For a $5 donation you can tour the famous Surf Ballroom and if you love music, this is a tour you will want to take. Behind stage at the Surf Ballroom. The Winter Dance Party tour was a 24 gig tour (in as many nights). Buddy Holly, J.P “The Big Bopper”, Ritchie Valens, Waylon Jennings and Dion made up the band. The band referred to it as the “Tour From Hell” as it zig-zagged all over the tri-state area. Some of the performers over the decades at the Surf Ballroom. It was freezing cold, as us hearty Midwesterners know January and February to be. 11 nights into the tour marked the fateful night. The tour buses (5 total) malfunctioned. They all had leaky windows. None could keep out temperatures that reached negative 30 degrees. On the 11th night, after playing the Surf Ballroom, some of the band members decided to fly from Mason City, IA to their next show in Moorhead, MN. They all wanted on that plane but only 3 would fit. A coin toss determined the ‘winners’ . Buddy Holly, age 22, The Big Bopper, age 28, Ritchie Valens, age 18 and of course, the pilot boarded that plane. They lost their lives just a few miles into the flight when the plane crashed into a cornfield just outside of Clear Lake, IA on February 2, 1959. To read more about The Winter Dance Party read this, this and this. Why is The Surf Ballroom Special? Present-day concerts include $75 + tickets in a stadium of thousands of fans, $12 beers, and nachos. The Surf Ballroom’s capacity is just 2,100 people in the 30,000 square foot venue. It has to be pure magic to see and listen to musicians in this quaint, historic ballroom. The shows are General Admission and range from $20-$30. The lineup of musicians who have graced the stage at the Surf Ballroom also makes it pretty special. The original coat check near the entrance. Note that it cost $1 to check coats. They did not resume responsibility for fur coats that were checked. Carpet is a replica of the original carpet. Here are some fascinating things we learned on our tour of The Surf Ballroom. Read this article for more history on the Surf Ballroom. The original location of the Ballroom was built in 1934 across the street from its current location. A fire destroyed the original building in 1947. The current building which is across the street is an exact duplicate of the original. Originally a big band venue, Lawrence Welk, Tommy Dorsey, Glen Miller are just a few of the big names that played at the Surf Ballroom. “Ocean beach club” is the theme. There is very much a “Beach Boys” vibe throughout. The Ballroom was inducted into the 2009 Rock & Roll Hall of Fame. The coat check and booths are all from 1948. Lights above booths indicate an occupied booth or if a waitress is needed. The carpet and hand-painted wallpapers are replicas of 1959, The Day That Music Died. The wooden dance floor is original. Imagine the stories these floors could tell! The phone that Buddy Holly used the night of the crash is on display. All current shows at The Surf are general admission. The Winter Dance Party was revived in 1979. The 4-day event takes place over the anniversary weekend of the plane crash. 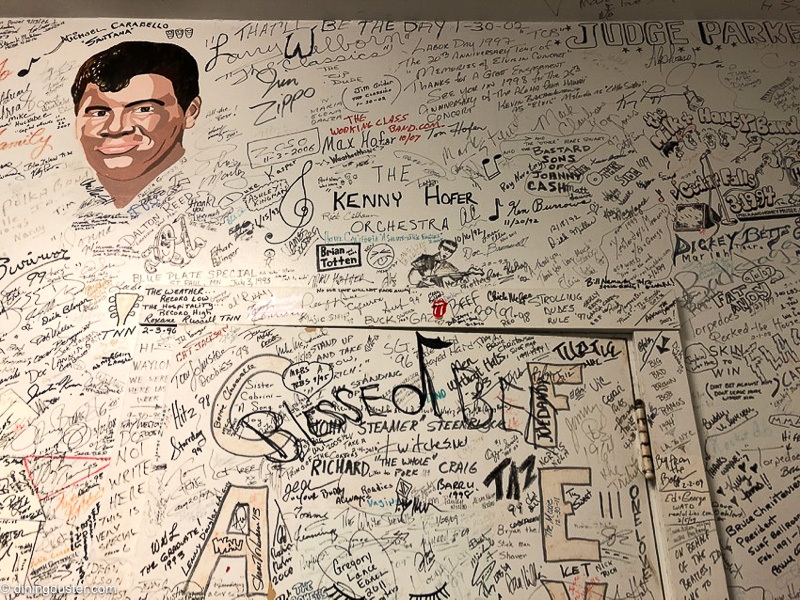 The walls are lined with memorabilia of musicians who have performed at the Surf Ballroom. The Green Room is actually painted white. The green room sits just off-stage. There must be thousands of signatures! The Green Room is right next to the stage. Imagine the likes of Santana, REO Speedwagon, Kansas, Alice Cooper, The Doobie Brothers, BB King, ZZ Top, Martina McBride, Lynryd Skynyrd, Gene Simmons, Kevin Costner and countless others sitting in this green room in Clear Lake, Iowa! The rest of the Surf Ballrom story told in pictures. The original dance floor at the Surf Ballroom. Imagine the stories these floors could tell! Original booth seating still exists at the Surf Ballroom. It’s easy to picture this room in the 1950’s. A week before we toured the Surf Ballroom Gene Simmons of Kiss performed. He tweeted out this picture. Dusty likes knowing he and Gene Simmons once stood in the very same bathroom. Have you been to the Surf Ballroom, what was your favorite thing? Hours: Memorial Day and Labor Day weekends hours are Monday – Friday 8:00 am-4:00 pm Saturdays 9:00 am-1:00 pm and Sundays 1:00-4:00 p.m. Admission: Self-Guided tours are available with a suggested $5 donation . Guided tours are $8 per person. I love this post! You’ve really captured the history and atmosphere of the Surf Ballroom. Thank you, Stacy! It was such a neat place to experience.